Mix dry ingredients, corn meal through salt in a large bowl. Mix together butter, eggs, and buttermilk and add to dry mixture stirring to thoroughly combine. Spray 2 muffin pans (24 muffins) with baking mix. 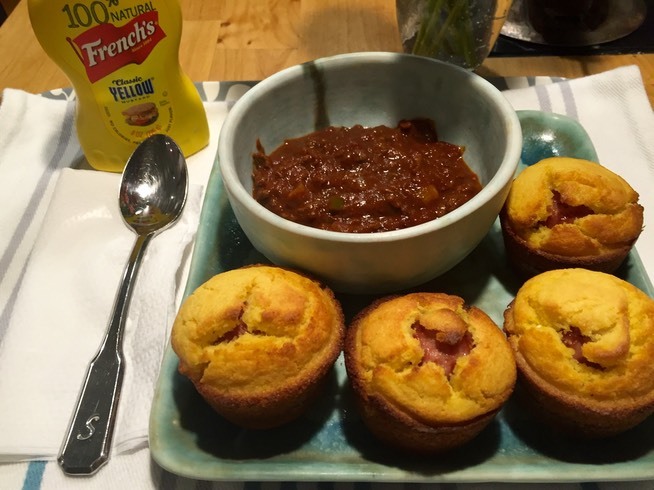 Fill each halfway (see photo) with muffin batter, add a hot dog fourth and top with a spoon more of cornmeal batter – you don’t have to cover it. Bake for 12 to 15 minutes or until golden brown. Serve with your favorite chili. or just a big dollop of mustard! You can’t go wrong!